This weekend marked the third annual Food Network New York City Wine & Food Festival to benefit the Food Bank For New York City and Share Our Strength. ICE is a partner of the festival. ICE students volunteered at over 160 shifts over the four-day festival. ICE students could be seen hard at work at the James Beard House for Holy Mole with Marcela Valladolid, Aarón Sánchez and Patricio Sandoval, Chelsea Market for Chelsea Market After Dark with Alton Brown and Pier 54 for the Grand Tastings showcasing restaurants and chefs from across the city. Students got to work with Food Network stars like Tyler Florence, Bobby Flay and Giada De Laurentiis at events such as the Sandwich Showdown, Tacos & Tequila and Meatball Madness. At just one event, six ICE students worked with Floyd Cardoz of Tabla, James Beard Award winner Madhur Jaffrey and Suvir Saran of Dévi at A Symphony of Spice in the famed James Beard House kitchen. In addition to student volunteers, Chef Jesus Nunez and Chef Henderson Butcher used kitchen space at ICE to do prep for the Grand Tastings. 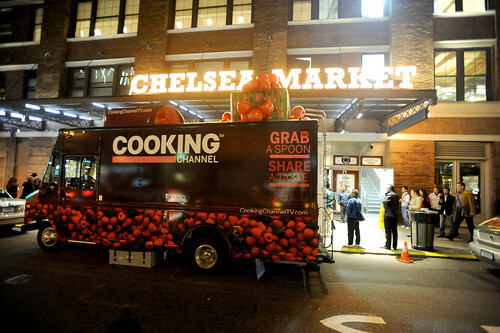 The chefs were able to use space here in our conveniently located kitchens in the Chelsea neighborhood and head right over to the Food Network headquarters at Chelsea Market. The weekend was a wonderful showcase of why New York City is one of the culinary capitals of the world and ICE was proud to be a part of it.